The head of a political research center has sent a letter to the State Duma chairman urging him to postpone parliamentary and presidential elections in Russia until Western nations stop their attempts at regime change through economic pressure. 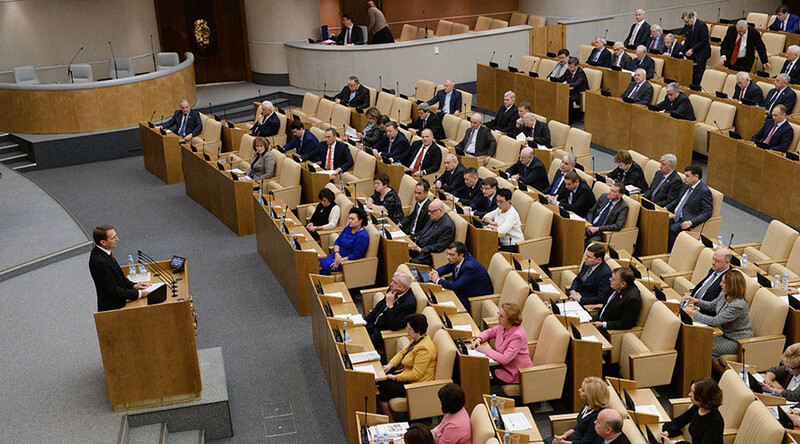 “I am asking you as the chairman of the State Duma - who has the right to come up with legislative initiatives - to look into the possibility to urgently amend the Constitution with acts that would protect Russia from regime change instigated from abroad and the subsequent breakup [that would result from this],” chairman of the board at the Institute for Political Infrastructure Analysis, Yevgeny Tunik, wrote in his letter to Sergey Naryshkin. The exact measure suggested by the analyst is a law that would automatically prolong the powers of Russian president and parliament in the event that the authorities decide to introduce a state of emergency or martial law. The new term for legislators and the head of state would last for six months from the moment of the cancelation of the emergency measures. Tunik emphasized that such a step would not violate citizens’ political rights as elections would not be canceled, only postponed. Tunik also elaborated in his letter that over the past two years Russia has experienced unprecedented pressure from Western nations, primarily from the United States. He warned that the economic crisis and price hike could cause social unrest and protests that, in turn, could bring to power “hostile, pro-Western or even extremist forces.” Canceling all elections for the period of economic crisis would prevent a situation when citizens are asked to make serious choices under pressure from circumstances that could provoke irrational decisions. “We all can witness the results of 2015 elections in Ukraine that were held in conditions of an undeclared emergency situation,” the analyst noted. While the State Duma speaker has not commented on the letter, the head of the lower house Committee for Constitutional Law, Vladimir Pligin MP (United Russia), said that he did not consider the initiative as viable. “All the latest efforts of the state power institutions and society in general are directed at preserving the constitutional norms in the Russian Federation. I think that there is no reason to change them at the current moment,” the lawmaker told RIA Novosti.